This year we have tried to stress the need for each congregation to grow via evangelism. In a land where truth is relative and ecumenicalism is embraced as “right”, evangelism pushes people out of their comfort zone. Thus accepting this great work of the church is a challenge for our young church plants. The Mumbezhi congregation is actually outside of the Mumena Chieftaincy and is pretty far out in the bush. The majority are from different tribes, Lunda and a few Congolese. Mumbezhi, however, has been excited about evangelism. 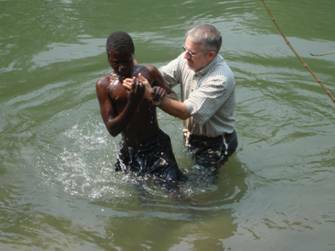 After teaching about the Gospel for several months, one Sunday when we arrived the congregation announced that 11 people wanted to put on Jesus in baptism. What a joy! We pray that all of our young churches will grow in this value and skill.